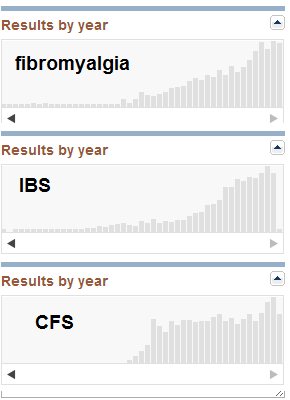 CFS/FM/IBS are difficult conditions to treat. One of the major challenges for physicians is that patients often hyper-react to drugs, do not react at all, or react contrary to the results with normal patients. Microflora changes may be the source of this unpredictability. A difference of microfloras can result in a half life of a drug changing from 6 days to 100 days as found by this 1988 [study]. This would explain the observed difficulty in predicting how patient actually responds. Assuming this is true, then mountains of “reasoned recommendations” for CFS / FM / IBS become illogical because the core assumption is that the absorption and processing will be like normal patients. Often I see patient refer to books that were written 15 years ago. Our knowledge have greatly increased and are not in these old books. To Illustrate this look at the following charts from PubMed. There are two recent books that should be on most patients’s bookshelf (or tablet). They are recent and reasonably complete. Be careful to get the 2012 edition and not the 1998 edition.